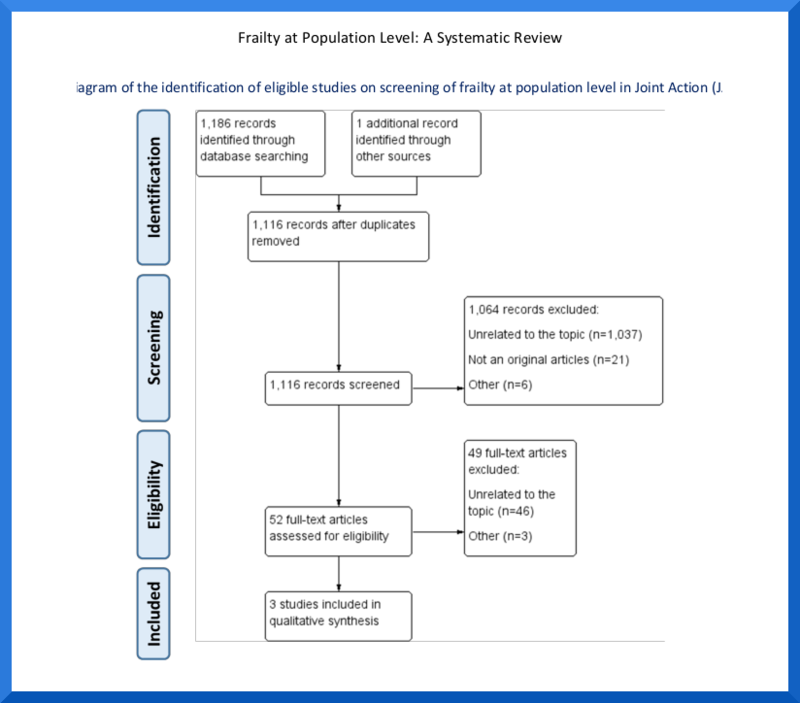 This review summarises the data on frailty prevalence, incidence, trajectories and transitions between different stages of frailty in JA ADVANTAGE Member States (MSs). 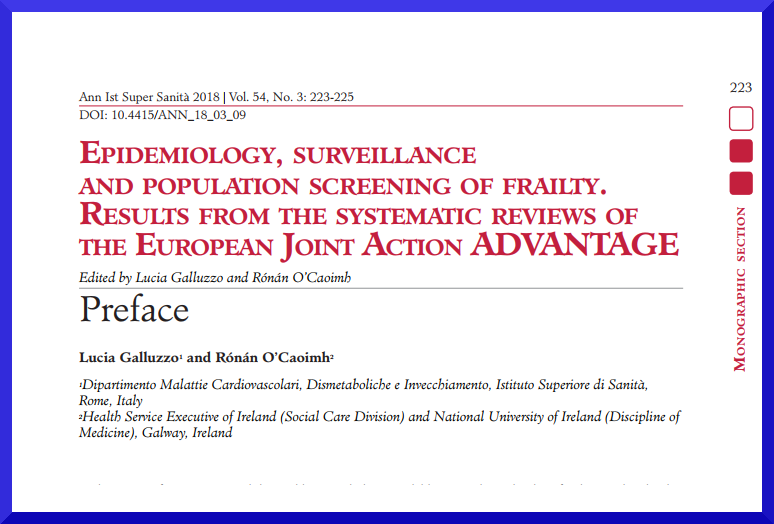 The existing evidence for systematic programmes and interventions for screening, surveillance and monitoring of frailty, including those delivered in the primary care setting, in 22 European Union (EU) JA ADVANTAGE MSs is investigated. Galluzzo L, & O’Caoimh R (2018). Preface to Monographic section 'Epidemiology, surveillance and population screening of frailty. Results from the systematic reviews of the European Joint Action ADVANTAGE' Edited by Lucia Galluzzo and Rónán O'Caoimh. Annals of Istituto Superiore di Sanità, 54(3), 223–225. Galluzzo L, O’Caoimh R, Rodríguez-Laso Á, Beltzer N, Ranhoff AH, Van Der Heyden J, Lamprini-Koula M, Ciutan M, Lopez Samaniego L, Liew A on behalf of Work Package 5 of the Joint Action ADVANTAGE (2018). 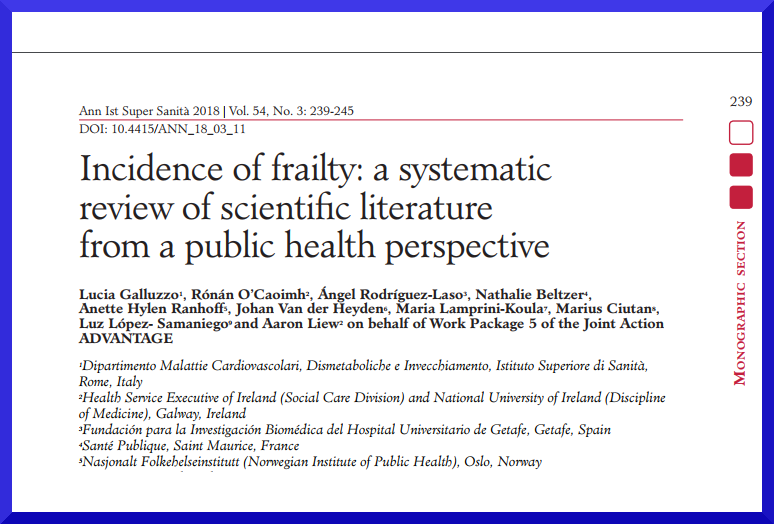 Incidence of frailty: a systematic review of scientific literature from a public health perspective. Annals of Istituto Superiore di Sanità, 54(3), 239–245. O’Caoimh R, Galluzzo L, Rodríguez-Laso Á, Van Der Heyden J, Ranhoff AH, Lamprini-Koula M, Ciutan M, Carriazo AM, Carcaillon-Bentata L, Kennelly S, & Liew A on behalf of Work Package 5 of the Joint Action ADVANTAGE (2018b). 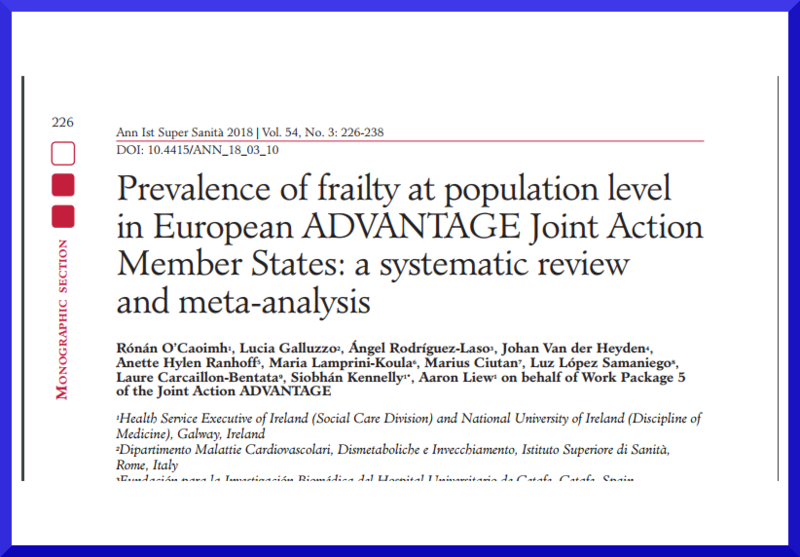 Supplementary materials for ‘Prevalence of frailty at population level in European ADVANTAGE Joint Action Member States: a systematic review and meta-analysis’. Annals of Istituto Superiore di Sanità, 54(3), 228-240. O’Caoimh R, Galluzzo L, Rodríguez-Laso Á, Van Der Heyden J, Ranhoff AH, Carcaillon-Bentata L, Beltzer N, Kennelly S, & Liew A, on behalf of Work Package 5 of the Joint Action ADVANTAGE (2018). 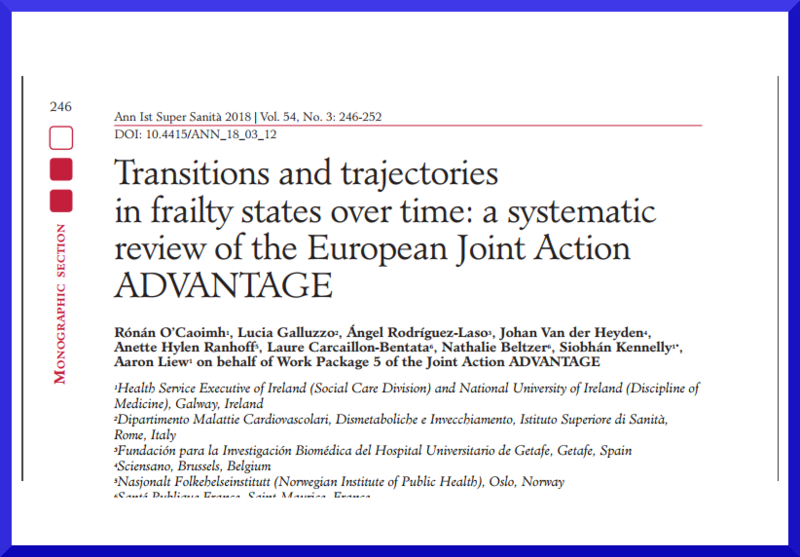 Transitions and trajectories in frailty states over time: a systematic review of the European Joint Action. Annals of Istituto Superiore di Sanità, 54(3), 246–252. Rodríguez-Laso Á, O’Caoimh R, Galluzzo L, Carcaillon- Bentata L, Beltzer N, Macijauskiene J, Bacaicoa OA, Ciutan M, Hendry A, Lopez Samaniego L, Liew A, on behalf of Work Package 5 of the Joint Action ADVANTAGE (2018). 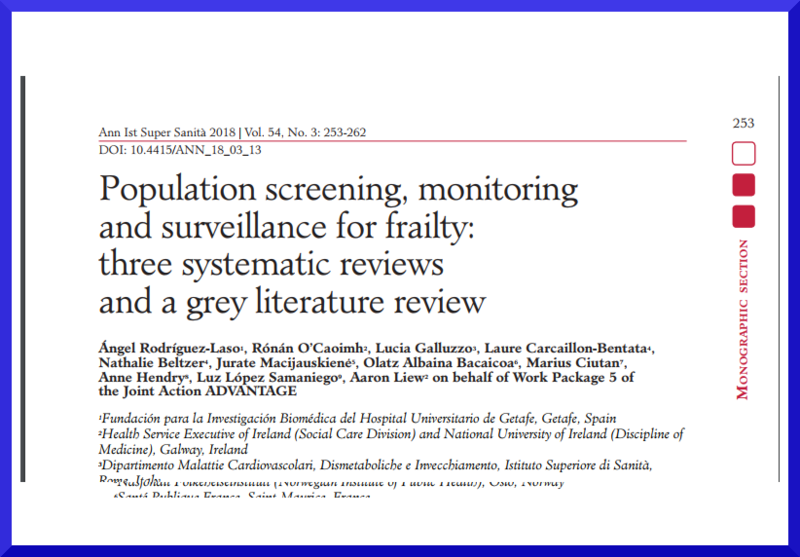 Population screening, monitoring and surveillance for frailty: three systematic reviews and a grey literature review. Annals of Istituto Superiore di Sanità, 54(3), 253–262.